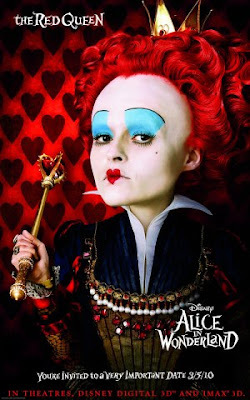 This past week Jonathan took me to see the new Disney/Tim Burton version of Alice in Wonderland (2010). 3. Not caring whether or not the story held true to Lewis Carroll's original tale. That all declared, I give this film neither a thumbs up or a thumbs down. It was weird which I feel was the point and purpose of the entire movie so it didn't fail to miss the mark with me. Then again, I've always found Carroll's story weird and endearing. It's a strange mix of imagination and hallucination and, not being terribly attached to the storyline, I don't really care too much what various interpretations people give to it. (Unlike Anne where if you stray a jot or tittle, I'd like to have your hide!) 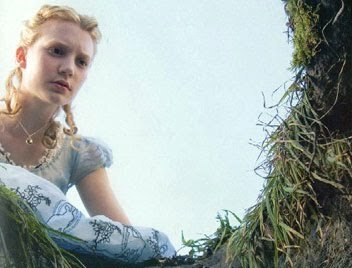 I did very much enjoy Frank Beddor's take on Alice in The Looking Glass Wars . I thought Burton kinda had the same idea and wondered if Beddor is grinding his teeth a little. The movie was all I expected from a Burton film. Weirdness. (I should probably pick a better word but I kinda think that one is just about right!) Strange characters who are over dramatized. Characters who are painted to look freakish or hilarious, depending on how you are predisposed to approach something which is pointedly unusual. "I'm afraid so, you're entirely bonkers. But I'll tell you a secret... all the best people are." This quote was used twice in the film and when I googled it I found a lot of people who identified with it. I find this most interesting. You can google the phrase, "Quotes from Tim Burton's Alice in Wonderland" and it comes up with some random, inconsequential remarks. But if you google this specific quote from the film, teenagers everywhere are 'going mad' themselves over it, trying to find ways to fit it into their every day conversations. Now, from the standpoint of going to the movies just to be entertained, we were that! We probably both enjoyed the first half of the movie better than the second half. Burton opens his story well and the costumes were really quite fantastical. It boggles the mind how much work went into birthing such visions of creativity in bringing well-known (and yet not known) characters to life. Speaking of the characters - I thought I would have managed to like the Queen of Hearts a little better if she had consistently made use of her lisp. (It came and went and I couldn't predict when I'd hear it next which was mildly disconcerting.) I didn't care for the White Queen (played by Anne Hathaway) at all. I thought she was just plain ridiculous. 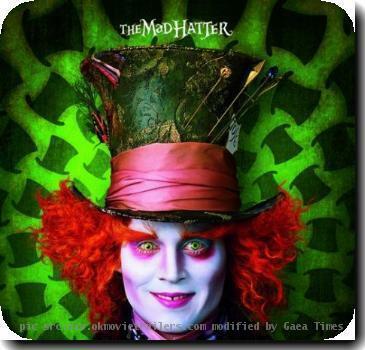 I DID like Alice and if Depp had been more toned down I might have been able to say that I liked the Mad Hatter. But since I was being told by Burton to like everyone because they were crazy, it turns out that I hardly liked anyone at all. Instead, I found the entertainment solely in the storyline which WAS unique and creative and - dare I say it - fun? The premise of the movie is great (in my opinion.) Alice is a bright and imaginative young girl who is being offered a proposal of marriage that society thinks she should not refuse. Alice, however, has hesitations and instead of marriage she chases a rabbit down a hole. You probably know where she goes from there. Instead of just exploring Wonderland though, it turns out she's been purposefully called in this strange new world to do battle against the Red Queen's Jabberwalky. Instead of a tripping around Tweedledum and Tweedledee (Disney-fied) it's Alice running from danger and trying to restore the White Queen to the throne. It's adventurous and suspenseful and I DID like that. I thought Burton did a good job making "Wonderland" feel like that was exactly what it was supposed to be called. Whether or not you would like the film is anyone's guess. I don't think it is so crazy a movie that it is to be avoided. However, I do think it is so crazy that anyone watching it should be careful and discerning about the message behind the movie. (For, to be sure, there are messages even when you aren't specifically looking for them!) For a date night out - it was fun and it gave us lots to talk about. As a way to just escape reality and relax? (Wait. Isn't that what date nights are for?!?!) Well, it's not a movie that I think you can just turn your brain off and sit through. There's too much there for one to think about and maybe that's one reason why the film hasn't been as successful as some hoped. It's SO crazy that your brain has to work overtime to take it all in and process it. Thanks for your thoughts on this. My kids will probably want to watch it when it comes out on DVD. My husband probably won't -- he hates the story with a passion (something to do with that logical, scientifically-based, practical mind of his :-) ), but then again he might just as a family thing. I've never really cared much for the story, either, but I'd be interested to see what they do with it. I think there is a balance to that "I gotta be me" thing. While it's true we're all different and we need to respect people who are different and to realize we're not all cut from the same cookie cutter, on the other hand, the different just to be different emphasis can go overboard. It's not about "me," and there is something to be said for knowing how to act in any given situation without just standing out as different and non-conformist. Of course, as you said, Burton has made a lot of money by being different and non-conformist. :-) And those aren't bad qualities in themselves -- but it all goes back to balance. If someone overtakes every situation with their differences just for attention, that's a little off-balance as a general philosophy. Ah yes! That's what Jonathan said when we walked out of the theatre and it's a good counter argument. Thanks for commenting on that because I do have to agree. Balance is necessary. Being an individual is good on its face. Not being afraid to stand out in a crowd, etc. But there's courageous individualism and then "LOOK AT ME! LOOK AT ME!" individualism. And that's how I felt Burton's film came across. It is really too bad that The Looking Glass Wars movie didn't come out before this movie. I think The Looking Glass Wars would of had a better storyline and better characters. At least Frank Beddor knows his movie will be a success with all the publicity and money Alice in Wonderland has brought to the box office.